I have one recipe left to share from our visit in South Dakota. It isn’t my recipe, but shared by my Cuzn Kyle. Cuzn Kyle (that’s how we spell cousin in our family) is kind of the unsung hero in South Dakota. He works really hard when he’s at the lake cooking for the family. In the mornings, he’s up early cooking everyone breakfast. 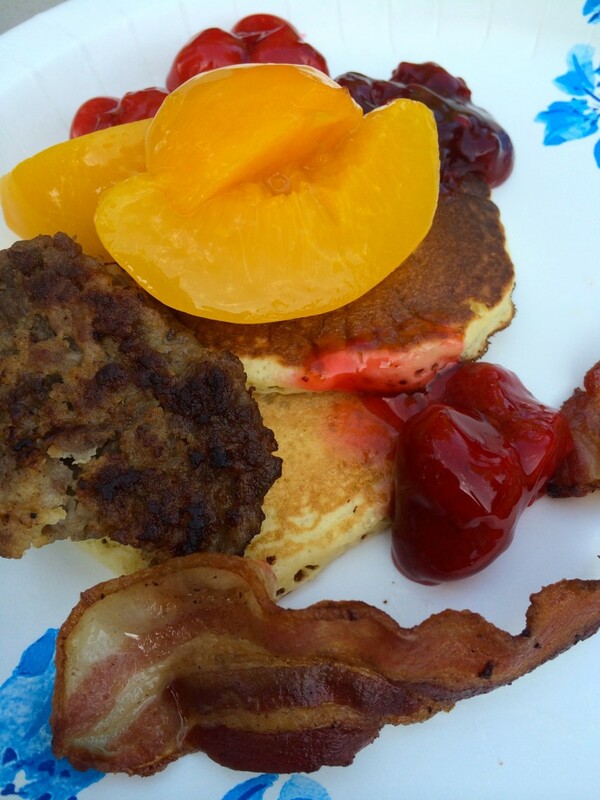 That morning, it was blueberry pancakes topped with fruit, scrambled eggs, sausage and bacon. It’s safe to say we certainly didn’t starve! Kyle is always in charge of the pig for the big family gathering. As mentioned in a previous blog, we weren’t able to get a full pig to roast, so instead they purchased a whole pork tenderloin at Costco. 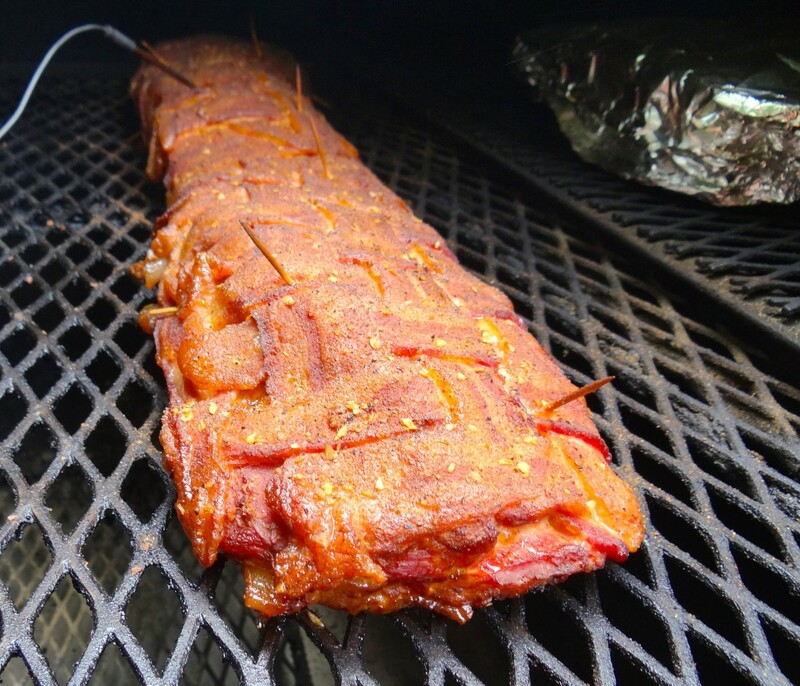 And if barbecuing a whole pork loin wasn’t enough…..he topped it completely with bacon that he weaved together! 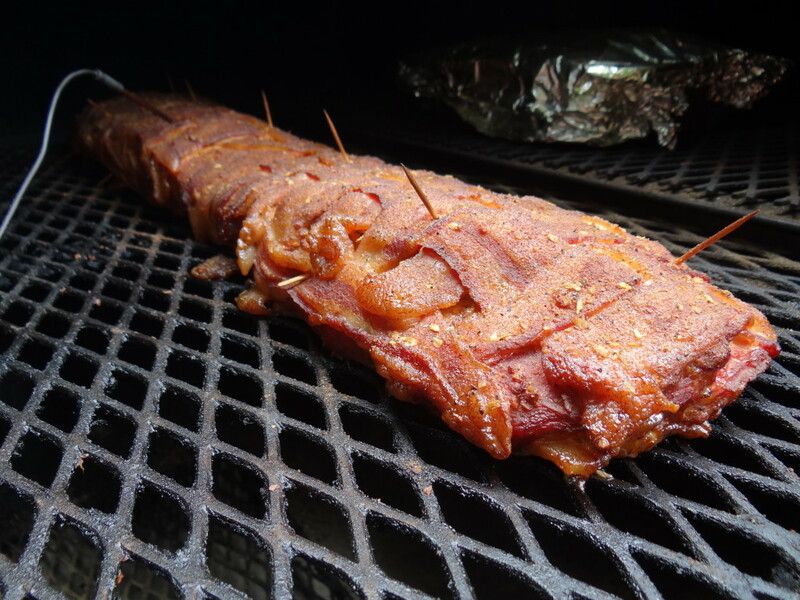 Close up of the grilled pork loin. He started by trimming all of the silver and fat from the loin. Next he rubbed a spicy brown mustard all over the loin. 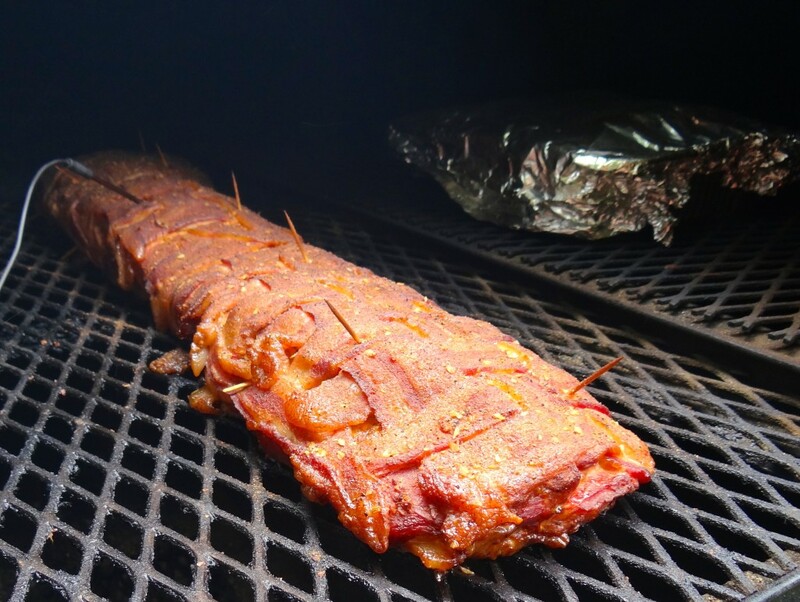 Bacon weave on top of the loin. A mixture of minced garlic, Lawry’s seasoning salt, thyme, and Famous Dave’s rib rub and a little water was mixed together. Then he rubbed that mixture on the pork tenderloin and covered it with bacon that was weaved together (like a basket weave….but with bacon!). 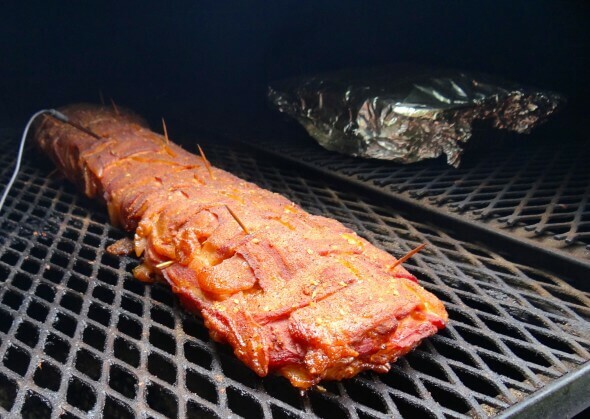 Before putting it on the grill, he lightly dusted the top of loin with rib rub and seasoning salt, using a couple of toothpicks to hold the weave in place. Another view of the AMAZING pork loin! Kyle smoked the loin at 225 for 2 hrs and then finished with no smoke for 3 ish hours till temp was 150. (If you don’t have a remote digital meat thermometer, I’d recommend making the investment. 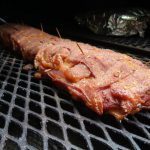 They are relatively inexpensive and make it so much easier when grilling) When the temperature reached 150 he pulled it from heat and wrapped it in foil and allowed it to rest for 20 minutes or so. After that it was time to slice & serve! Words do not describe how delicious this was! 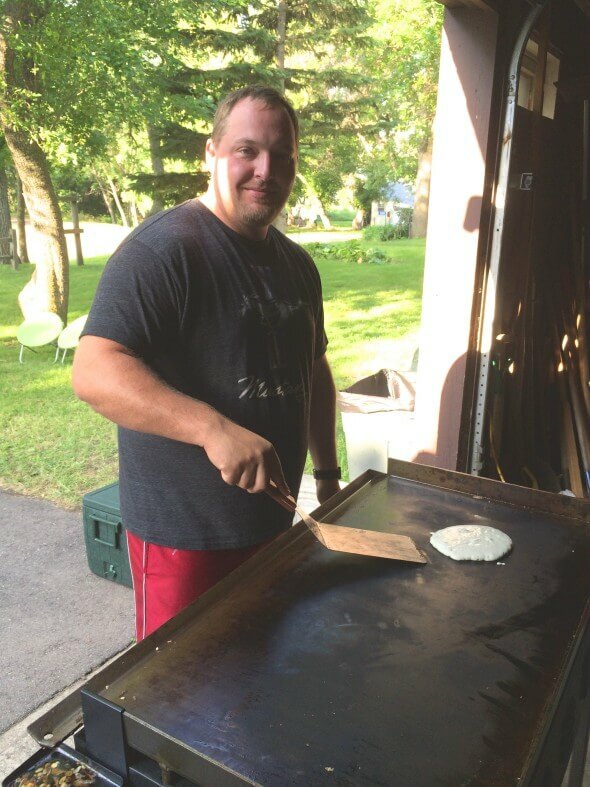 Cuzn Kyle has mad skills on the grill and each year he does an amazing job! He puts a lot of time and effort into this meal each year and never disappoints! Servings a crowd? Pork Tenderloin on the Grill - Words can't describe how delicious this was! Cuzn Kyle is the unsung King of the Grill! Weave the bacon together (similar to a basket weave or pie crust). Combine the garlic, thyme, seasoning salt and rub with 3-4 tablespoons water to form a paste. Rub the entire pork loin with the mustard. Follow with the garlic/spice paste mixture. 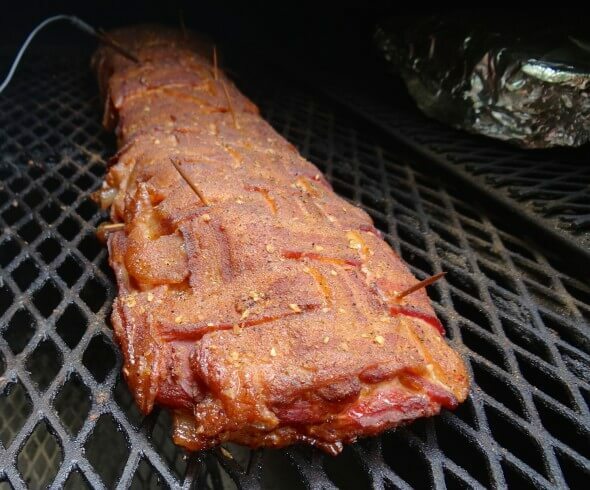 Cover the top of the pork tenderloin with the bacon, lightly dust the remaining tablespoon of rib rub over the top of the pork loin. Secure the bacon in place with a couple of toothpicks. Smoked at 225 for 2 hrs and then finished with no smoke for 3 ish hours or until internal meat temp is 150 degrees. Remove from grill, loosely wrap in foil & allow to rest for about 20 minutes. This serves quite a crowd - we had 35 for dinner that day and had plenty of leftovers! The bacon kept the meat moist & gave it great flavor. wow that’s a very impressive hunk o’ meat you got there! I gotta try this! thanks! It was really yummy Stephanie! What a great meal to bbq for a crowd! This tenderloin was fixed to perfection. I was there and was a great meal. Loved it I fixed a smaller one at home later and it was also great. Loved it. So easy and so much flavor, right Lois? Great recipe from Cousin Kyle.